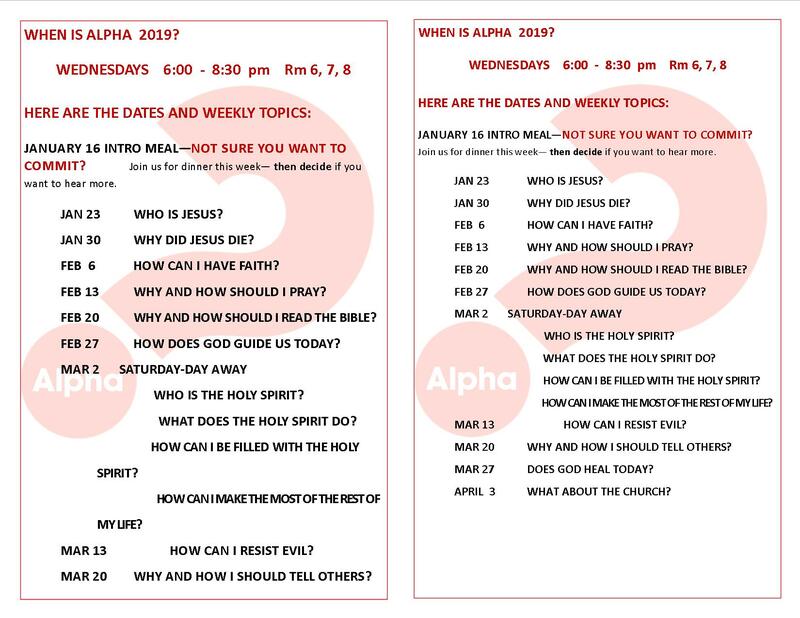 For more information on the Alpha Experience visit www.alphausa.org or view the downloadable schedule here. Register for Alpha online here or contact Anita Daroczy in the Faith Formation office via phone at 248-685-2702, ext. 204, or by email at: stmaryamd@comcast.net. Alpha is 10 weekly sessions with a one day-away. Each session includes a meal, a DVD presentation and small-group discussion at the end where everyone is welcome to ask questions and share opinions. Participants usually stay in the same small-group every week to get to know each other, continue discussions and deepen friendships. Anyone and everyone who’s interested in exploring Christianity in a friendly, open and informal setting. People from all backgrounds come to talk about their questions about the existence of God, the meaning of life, what happens after death, what Jesus taught and more! The Alpha Experience is a down-to-earth introduction to the Christian faith where anyone can explore the meaning of life in a relaxed, low-key setting with friends new and old! When and Where is Alpha? What Are Catholic Leaders Saying About Alpha? “…we need a new evangelization which, while being open to all the fullness of the truth and the Christian life, will yet be simple and basic. This quote is the reason why I look with interest and appreciation to the Alpha Course, it seems to me that it answers precisely this need of ours. The very name shows this. It is not called ‘Alpha and Omega course’ but simply ‘Alpha Course’ because it doesn’t claim to lead people from beginning to end in faith; only to help them get acquainted with it, to foster a personal encounter with Jesus, leaving it to other Church departments to develop the newly rekindled faith.” Fr. Raniero Cantalamessa, Preacher to the Papal Household. “Many Catholics have been Catholic for all their life and have a relationship with Jesus but they are not really conscious of it and not intentional about it. Alpha really helps them discover the intense relationship Jesus wants to have with them.” Bishop Michael Brynes, Archdiocese of Detroit.